Eating vegetarian in Paris doesn’t have to be boring. Drool over these top restaurant recommendations. When you think French cooking, naturally meat and dairy products come to mind. Boeuf bourguignon, escargot, maigrit du canard… BUTTER…. yep, the list goes on and on. BUT! That does not mean there aren’t many amazing vegetarian and vegan options making their own in Paris. I’ve tested and tried many option throughout the city, so I’m in the unique position to tell you what’s good so you don’t waste your time. Here’s the round up of my absolute favorites vegetarian restaurants in Paris. The decor inside this place is what got me to go in the first time I visited: it’s bright white walls topped off with exposed brick and comfy pillows lining the bench seating?! One mention of the word ‘cozy’ and I’m sold. Plus, not only is this trendy Marais restaurant vegetarian, it’s also gluten-free and dairy-free. The menu is constantly changing which is a sign that they only use the freshest (and typically, local!) ingredients possible, another selling point for me. The desserts. The chefs swap out refined sugar for all natural agave, and replace dairy milk with almond. This is company founder/amazing-tour-guide/vegetarian-for-most-of-her-life Karen’s pick for her favorite vegetarian restaurant in Paris. So of course I had to include in on this list! Arpege is a Michelin-starred restaurant run by chef Alain Passard. It originally opened back in 2001 but he decided to close down for a while to rethink the direction he was going in career-wise. When he reopened the restaurant he decided that from then on out he would only cook with vegetables. The results are mouth-watering (as you might excpect from a Michelin restaurant). This is the most expensive choice on my list (ALSO as you might expect from a Michelin restaurant)… but I swear it’s worth it. The ‘steak’ tartare that is actually made of beetroot, horseradish cream, and carrots! YUM. 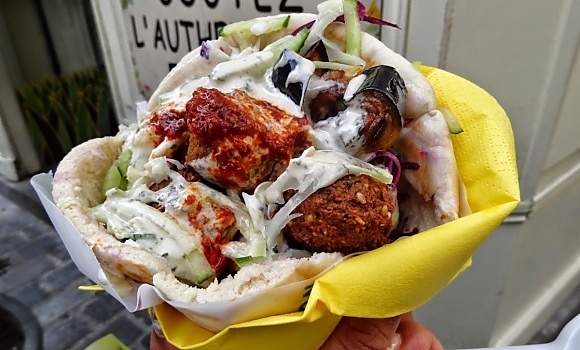 How could I compile a list of the best vegetarian restaurants in Paris without including our beloved L’as du Fallafel?! If you’ve been on our Jewish History of Le Marais tour, you’ve already tasted the delicious food here at L’As. If you haven’t… you NEED to. This place is so well known worldwide that it was featured a New York Times article – that’s saying something! Something we love about grabbing lunch or dinner at this place? It’s portable. Located in the heart of the Marais, there’s nothing we recommend more than taking your food to go to enjoy on a nice stroll through the charming neighborhood. The original fallafel sandwich – of course! Open: Sunday-Thursday 11am-11:30pm, Friday 12pm-4pm. Closed on Jewish holidays. This is another restaurant that changes its menu very often. By now you know that means they’re cooking up only the freshest, most in-season veggies they can find. Now I know you’ve heard this buzzword floating around the foodie scene for a while… what the heck does it mean, though? Here “superfoods” means pomegranate, açai berry, blueberry, avocado, spirulina, flax seeds…you know the drill! Mega-bonus: all of their products are 100% bio, gluten free, and made in house. The plat du jour (daily special). The freshest option on an already fresh menu? Sold! Potager translates to English as vegetable garden… that’s a promising sign. The goal at Charlotte’s garden? To make the least possible negative impact on the environment while still serving up some of the best vegan dishes I’ve ever tasted. Treating your body AND the environment right? What more could you ask for?! French cooking without butter, cream, or eggs presents a challenge, but the chefs at Le Potager really know their stuff. If you can make something yummy without butter, you’ve officially earned my respect. Once a week, on Sundays, there’s a special all-day ‘late breakfast’ menu. Need we say more? 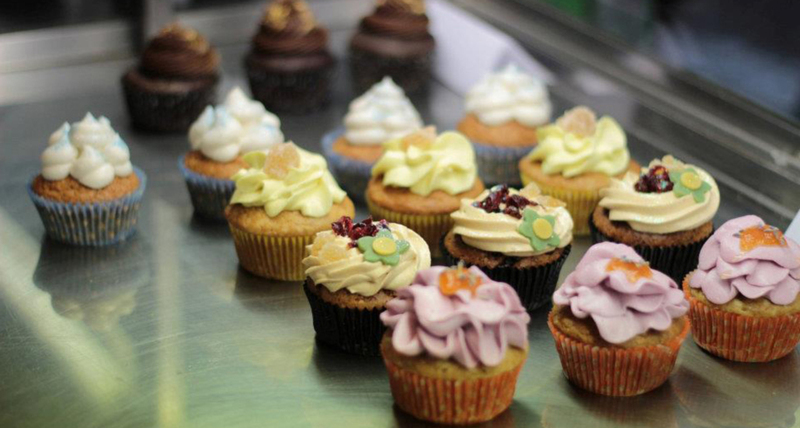 Located on the busy Rue Mouffetard (where you’ll find us giving our Tickle Your Tastebuds food tour), Vegan Folie’s is the hotspot for vegans that like the sweet stuff. Yup, this place’s specialty is desserts! All natural, dairy-free, vegan desserts. To veggie or not to veggie, that is the question! Actually, the real question is, will you try out some of my recommendations the next time you’re in Paris? Let me know in the comments below! This entry was posted in Food & drink, Restaurants & Cafes and tagged dinner, lunch, restaurant, vegetarian. Bookmark the permalink.